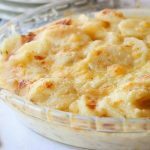 These Instant Pot Scalloped Potatoes are easier than any scalloped potatoes that I have ever made previously. I am a potato lover to the extreme. I once received a potato as a Christmas gift. So, to say my devotion runs deep would be accurate. 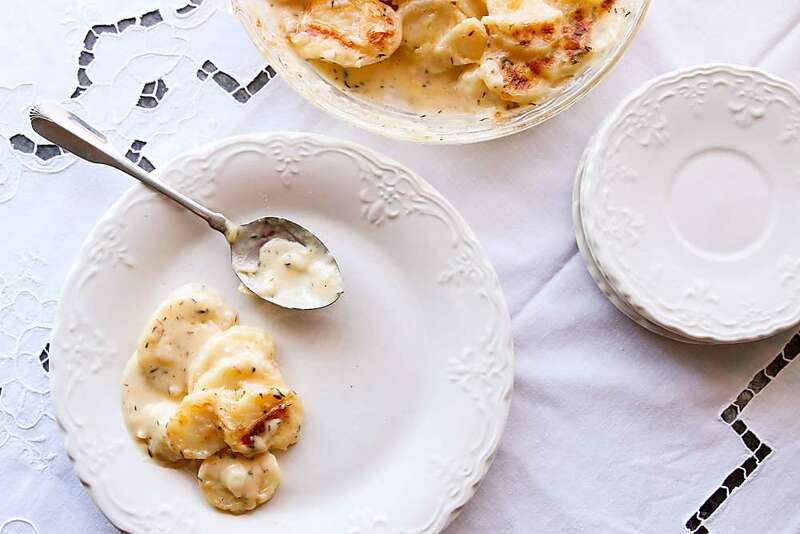 I grew up on boxed scalloped potatoes, aka “au gratin” if we’re being French about it. They were on a fairly regular rotation as a side dish. So, when I grew up and started making scalloped potatoes for myself from scratch, I discovered that they can be tricky to execute perfectly. For me, it’s important for the potatoes to be soft, but still hold their sliced form. I like them to have a healthy dose of cheese sauce, but not turn into potato soup. This recipe for Instant Pot Scalloped Potatoes takes out all of the guess work and gives you the best scalloped potatoes I can personally recall. I’m definitely going to try this for easter dinner! Awesome! Me, too! Any questions, just holler! Any advice on doubling the recipe? I’m thinking of using a glass 9 x 13″ pan for the broiling part. Happy cooking and let me know how you like it! These look wonderful, along with all your recipes. If I do not have a pressure cooker, how long would I boil or steam the potatoes? Thank you! Thank you! I would recommend boiling the sliced potatoes for 4 to 6 minutes (until fork tender, but not falling apart), though you’ll probably need more than 2 cups of liquid to submerge them. Then, for the sauce,drain off most of the liquid, just reserving 3 Tbs of the liquid (it’s important that it’s the liquid that cooked the potatoes because the starches from the taters will help thicken the sauce) in the pot and then rock and roll as per the rest of the recipe from there. Let me know if you’ve got questions! They’re tasty! <3 Happy Easter, lady!!! Hi. I’m greatly looking forward to trying this recipe. I was wondering could I double or even triple this recipe? If so, would the times change or just the ingredients? Thank you! I hope you love it! I have doubled it with absolute success. Keep the times the same and just double the ingredients and you’ll be good to go. But, I did try to triple it once and it just wasn’t quite as magical. The potatoes were unevenly cooked and the sauce didn’t cover in the same way. What do you mean by boiling them 4-6 minutues ? Before you put them in the insta pot? Hi Laurie. Do you mean the instruction to broil? That’s putting them in the oven after they’re cooked in the Instant Pot just to crisp them up and brown them on top. Enjoy! She was answering a question for a person who did not have a pressure cooker. I did the potatoes under high pressure. They came out a little soft. Should I have done low pressure? If you’re looking for them to be firmer, then low would be great! What about doubling this recipe? Doubling this recipe works great! The ingredients will all be doubled but keep the timing all the same. It doesn’t need to cook longer. What size instapot does this recipe call for? I use the DUO Plus 60, but it should work in any size since it’s not a large amount. I cooked the potatoes in Better than Bouillon Chicken Base. I used 1/2 n 1/2 because I had that on hand. Added sliced, cubed cooked ham and a bit of dried mustard to the cheese sauce. It was a hit!! Hubby loved it!! I would have added frozen peas but I had none! Thank you for an easy, yummy dish, perfect for a cold fall night!! I used onions, i chopped and added on top of the potatoes before pressure cooking! I recommend using a metal steamer of some sort. Way easier to get out of the pot. So glad you liked it! Woot woot!! And yep, 1 minute is perfect, right? I tried it with 2 minutes and they were just too mushy for my taste. Hope you had a happy Easter and thanks for letting me know it went well!! curious how many people this served? it looks delicious and i can’t wait to make it, but i need to serve about 15 people. thanks! This version of the recipe serves about 6, so I would double it and you’d be fine. Enjoy! Can you double it in one run in the Instant Pot? Or would that be too much? I have the 6-quart, I believe. And would the one minute time still be long enough to cook twice as many potatoes? Or should I up the pressure time to 2 minutes? And do you instant release the pressure or let it naturally release? I’m looking to make this for Christmas, but I need to serve a lot of people! Yep. I’ve doubled it before in the 6 quart with no problem. But, don’t increase the time. Keep it all the same, just double the ingredients. I did try to triple it once and it didn’t work. The sauce just wouldn’t set up right. But doubling is great. Definitely quick release the pressure. Natural release will overcook them. I hope you enjoy it! We have a new family favorite! I made this recipe, using my Instapot and doubled it for Easter family meal and ran out! Everybody wanted seconds. My son and grandson said they will never eat Au Gratin’s from a box again. Thank you so much for this excellent recipe. Could you tell me how many pounds of potatoes you use? We made the recipe and loved the final product but had to improvise a little. We only had baking potatoes in house and evidently our 4 baking potatoes were larger than the 7-8 medium. Our potatoes scorched and had no liquid left. Size can be quite relative I suppose on the person looking at them so if I had pounds that would be a great help. Thanks for the great recipe and look forward to making it again. So sorry for steering you wrong! I believe it should be about 2 pounds of potatoes, though I’ll definitely whip out the scale next time I made this recipe just to confirm it. But, certainly doesn’t hurt to add extra water to the pressure cooker and then strain off the excess just to be safe. But, definitely, I was planning to do this one as a video coming up soon, so I’ll confirm for sure the exact weights. Thanks so much and happy cooking! I made these tonight. I didn’t have white cheddar so I used Tillamook cheddar. Hubby gave then two thumbs up. So easy and very ?. Thanks for the recipe. Oh my goodness – I just made this and it is absolutely gorgeous!!! The potatoes are so creamy and the taste – YUM! Thank you so much for the recipe !!! Tonight I found that Evaporated Milk works just as well as heavy cream (I never have that on hand.) My husband is so happy I found this recipe and I love that there are no “weird” ingredients in it. That is fantastic! So glad it worked and thanks for letting me know. If I’m in a pinch, I’ll definitely give it a go. Cheers! You should be able to add cubed ham to this?? Thanks!! Oooh, that could be a fun addition! If you try it, let me know how it goes! I forgot to add that I used red potatoes and I did not peel them. So much fun!!!! I had never thought to try red potatoes, but I bet that would be so good! Can’t wait to try out this variation. Lots of love and hugs! I am new at Instant Pot cooking. I made the Instant Pot Scalloped Potatoes for lunch today. It was easy to put together and the taste was wonderful. I put in some onions and left over ham during the “Saute” setting. My husband really liked it and we have enough left over for another meal. Any advice on if these are freezable? Unfortunately, this dish wouldn’t freeze well. I haven’t personally tried it before, but I imagine the cheese sauce might become lumpy and separate after freezing. I don’t know what I’m doing with cooking let alone this Instant Pot, so I found your video very helpful. We had 4 adults and 2 kids in my Thanksgiving dinner and there wasn’t quite enough scalloped potatoes for us. If I make it again I’ll double up the recipe. I also needed more cheese and cream for this. The Instant Pot was just too hot on sauté, so I will do that in a normal pot next time. Unless I can turn the temp down somehow but I couldn’t figure that out at the time. Aside from that it was very yummy. Is there another liquid I could use rather than veg stock? I prefer the taste of cheesier creamy scalloped potatoes recipe I normally use. These scallop potatoes are GREAT!! My son has Celiacs Disease and these are perfect. No extra mystery ingredients. Just good stuff. It’s 5 STARS. These scallop potatoes are GREAT!! My son has Celiacs Disease and these are perfect. No extra mystery ingredients. Just good stuff. So glad you like them! I have a friend with Celiacs and this is an easy go-to when we have them over for dinner. Hugs!!! I added 1/2 cup chopped onion and some cubed ham to the potatoes. Recipe is a keeper. It usually takes about 2 1/2 hours to make my traditional scalloped potatoes and ham. This took less than an hour. If I want to omit the cheese, can I just add extra cream? Will that thicken? 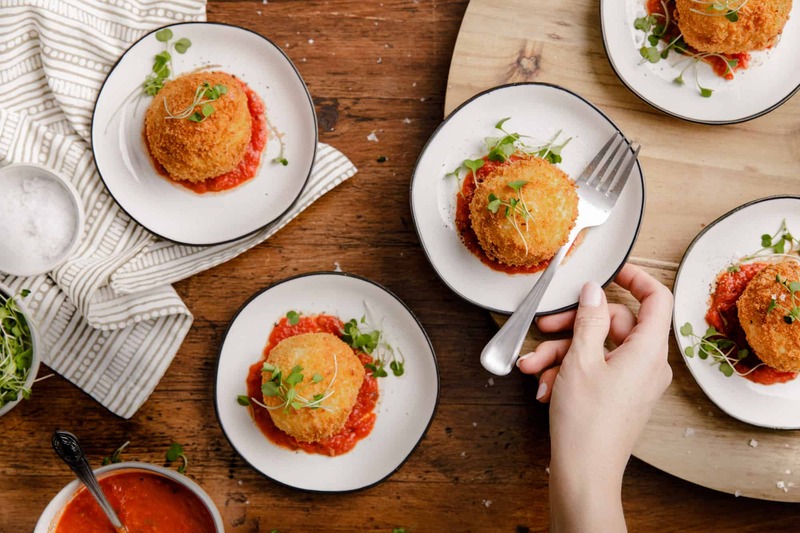 I’ve never tried it, but because this is a quick style recipe, following the directions as written and omitting cheese, I’m worried would make them too wet and not creamy. You’d need more time in order for the cream to reduce. But I did find a scalloped potato recipe that doesn’t use cheese that sounds great: https://www.epicurious.com/recipes/food/views/gratin-dauphinoise-scalloped-potatoes-395310. Hi Joanie. Your recipe sounds awesome! Question. Can you make the scalloped potatoes with corn starch instead of flour? I have family with gluten issues. 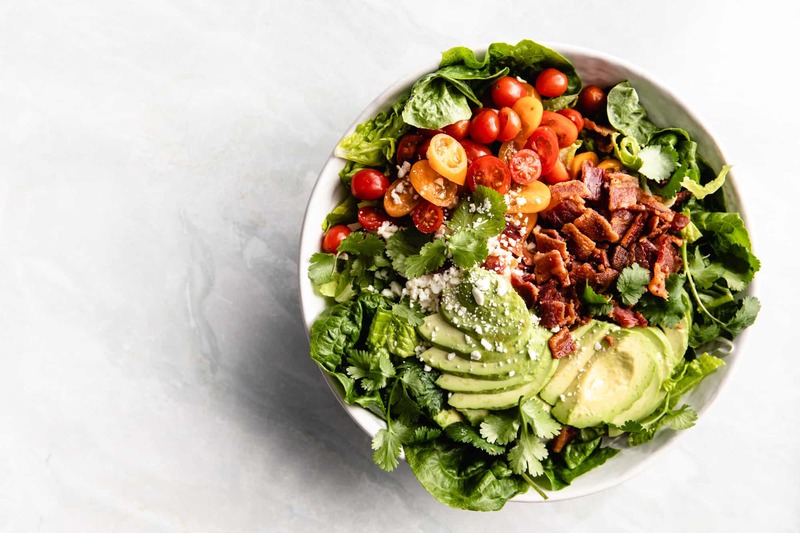 Also can I make this recipe a day ahead and reheat in the instant pot? Hi Diana. Great news is that there is no flour in this recipe so no need for any substitutions. As long as your vegetable stock is gluten free, this is a gluten free dish without making any changes. As for making it ahead, if you scroll to the end of the post, just above the recipe, you’ll see my make-ahead instructions. Enjoy! This was so easy! When I was a kid, my mom always said scalloped potatoes were too much work for an everyday meal. 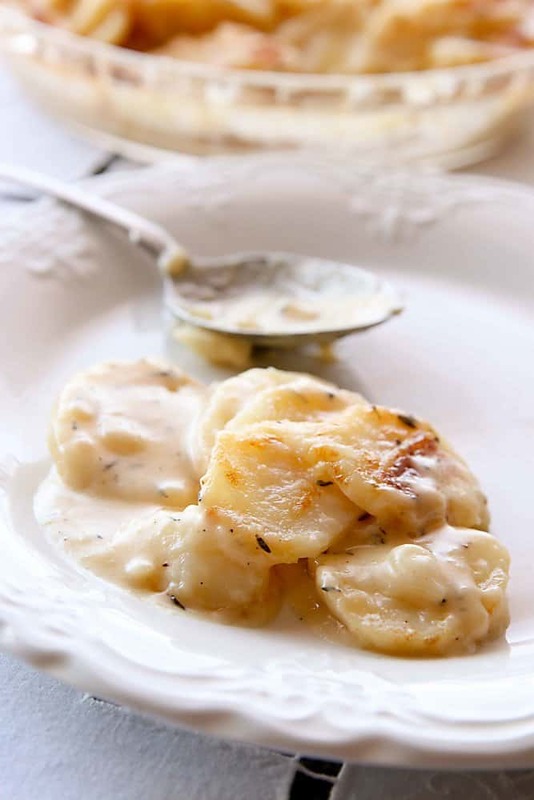 With your recipe, there is no need to save scalloped potatoes for a special occasion. Thank you for this easy to follow recipe for a new favorite. So glad you like them!! 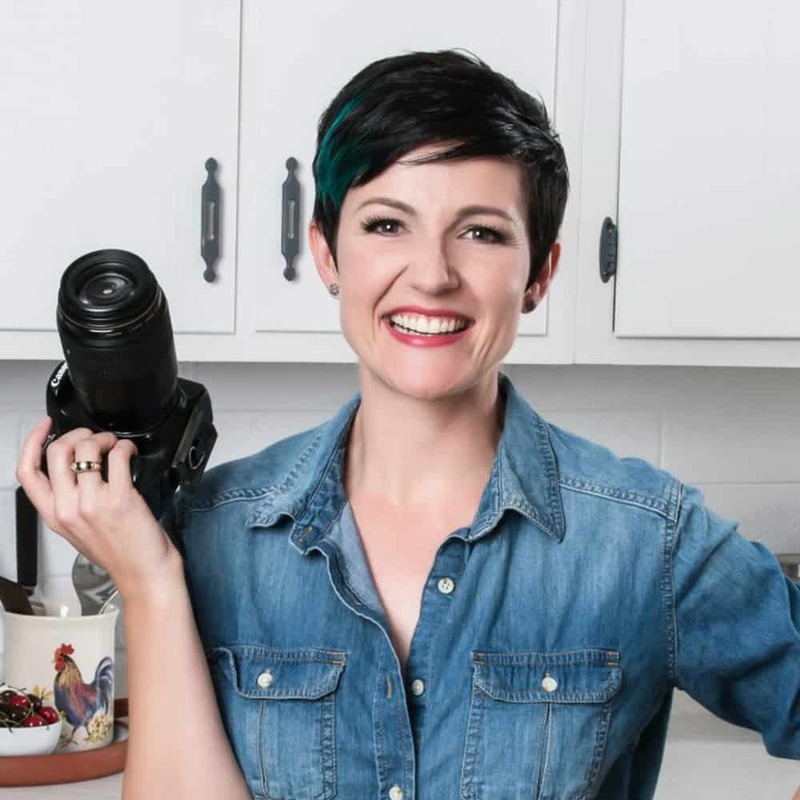 Instant Pot to the rescue!!!! Would I be able to make this without heavy cream? I have a family member that can’t have dairy. Is there something I could use as a substitute? 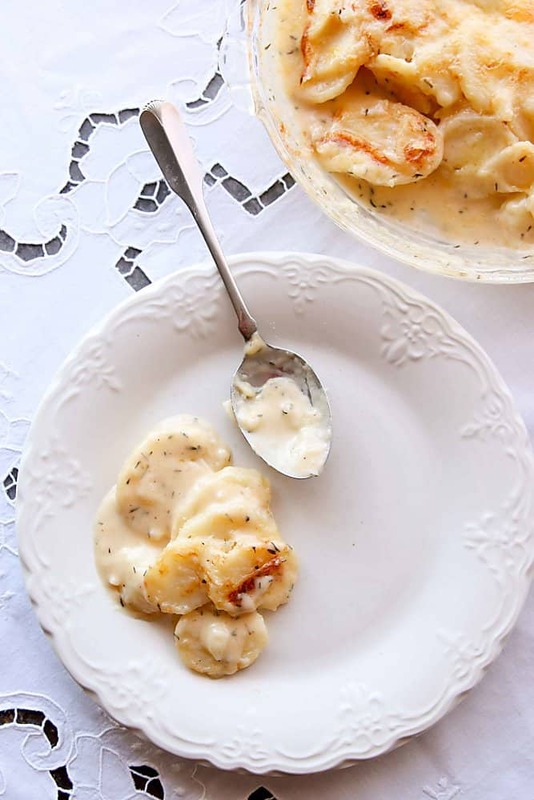 I’ve been looking for a great scalloped potato recipe for my instant pot. Thanks so much for sharing. Hi, these look delicious and I can’t wait to try this out! What kind of potatoes did you use? I use regular russets, but lots of folks have tried this recipe with red potatoes and yukon golds with success, too. Really great! I added minced garlic and used smoked cheddar–yum!! Such a great idea! Will have to try! I want to make this for a lot of people. I have a 6-quart instant pot. if I fill the pot to maximum with potato would I do about 3 or 4 minutes instead of one? Hi! I have attempted to double and triple this recipe before. Doubling works just fine. Just double the ingredients and keep the timing all the same. But, when I tripled it, the cooking of the potatoes was inconsistent and despite a few attempts, the sauce was always off in terms of texture and coverage of the potatoes. So, if you’re going to make it for a large group, I suggest multiple double batches, if that makes sense. Hope it goes well! These were amazing!I’m a new Instant pot convert and after a trial run today, these are definitely going to be part of Christmas dinner!! Thank you! Hooray! So glad you like the recipe. It’s a personal favorite! Do you think I could bake these at 375 for the bubbly crust for a period of time rather than broil? That would help match up the timing with the fish I am making. Thanks for your insight! Hi Casey. My concern is if you baked it longer at a lower temp that the potatoes would get too mushy being that they’re cooking longer. But, if you don’t mind the potatoes being softer, it wouldn’t be too much of a problem. Sorry that’s not a straight answer. But, hope you have a wonderful meal!!! I’m making these tonight! I use cream cheese & 2 kinds of shredded cheese in my sauce, so I’ll probably adapt the recipe for that part. I’m looking forward to non-mushy potatoes! Made th we tonight for a trial run before Xmas. They were great! But I have about 20 people to serve so I’m thinking I need to quadruple the recipe. Do you think it best to do it in two sets? So do double th recipe, pressure cook, pour into pan then repeat and pour again into the pan and then refrigerate and/or broil? Also wondering if you can recommend how sharp of cheese to use. I used sharp white cheddar aged 2 years but it seemed like something was missing from the recipe-a bit of flavour somewhere but I can’t put my finger on it. Suggestions would be great. Hi Christine. Yep, I’ve tried doubling and then also tripling this recipe. Tripling didn’t work well, but doubling did. Though keep the pressure cooking timing the same. As far as extras to add, I find that the vegetable stock that I use is really flavorful and that helps. But, if you’re looking to add some interesting flavor with another cheese, I’d try a parmesan. Hope it all turns out well. Sorry for the delayed response! I made this today in my son’s instant pot and it was delicious. I am going to add onions next time but otherwise, it was great. I used 19oz of cooks ham, diced and added to the pot while cooking the potatoes. I also used a blend of low moisture part skim mozzarella, mild cheddar and not smoked provolone and omitted the salt, as there was ham in it already. I have never made this dish before, it took about the same time as yours. This recipe is DELICIOUS! My family loved it. I wanted to use up some of the left over ham from Christmas dinner, so I added it, along with a couple extra splashes of cream to the potatoes and the rest of the ingredients just before putting it into the broiler. This will definitely be a regular, with and without the ham. Thanks for sharing! So glad they were a hit! I’ve heard a few other folks adding ham and loving it. I definitely need to give that a try! So so good! Best potatoes I’ve ever made! Whole family loved them. Used up the leftover Christmas ham. Several relatives also got insta pots for Christmas and we’re sharing recipes. I’m definitely passing this on to them! Thanks for sharing! Do you think these could be frozen? I was thinking I could double the recipe and only broil half. Then layer the remaining half in a foil pan and top with cheese to freeze and cook in the oven at a later time. Hi Melissa! You could definitely give it a try, though I’ve never done it so I can’t say for sure. But, I can’t imagine it would be too problematic. Hope you enjoy! What is your altitude? I live at 6500 ft and typically have to add time to my pressure cooker but knowing your alttude would help me know how much to adjust it. We’re at 1086 in Phoenix, AZ. Happy cooking! I have never tried it with red potatoes, but I have heard from other people that they work just the same. Cheers! Thanks for sharing this recipe! I really like this method, it’s so easy and takes so much less time than the recipe I’ve been using. I thought I would share the changes I made to make it dairy-free: vegan cheese and coconut cream instead of heavy cream. I doubled the recipe, but used less than 1/2 the amount of cheese called for. I also prepared this earlier in the day, up to putting it in a dish, then broiled it later. It took a few minutes longer in the oven, but It turned out very well, perfectly creamy & tender, and it tasted so good, no coconut flavor at all. So happy that I found this, thanks! Oh wow!!! That is fantastic!!! Thanks for sharing the vegan version! Sounds delish! Hi Joanie! This was great! I couldn’t believe this was cooked in one minute! Yep! It was! But… I did add sliced onion an garlic to it then PC it! It was amazing! I made the cheese sauce but I only added enough sauce to coat potatoes as I didn’t want a soupy potatoe. It was awesome! I added. Buttered panko n extra cheese to top! Broiled as directed! It was a hit! Will make it again! Thanks sooo much! Ooooooohhh!! Love that you added Panko! Genius!! I had a couple of questions — one which was related to doubling the recipe which was answered and I am going to do that. Second question… I am making this to take to a dinner on Saturday. Should I do all the steps except for the last which is the broiling and I could do that at my friends home? Will they be hot enough if I do it that way? Any advice would be appreciated. Yep! Follow the recipe until the very last, then pop it in the broiler for a few minutes right before it’s ready to serve. 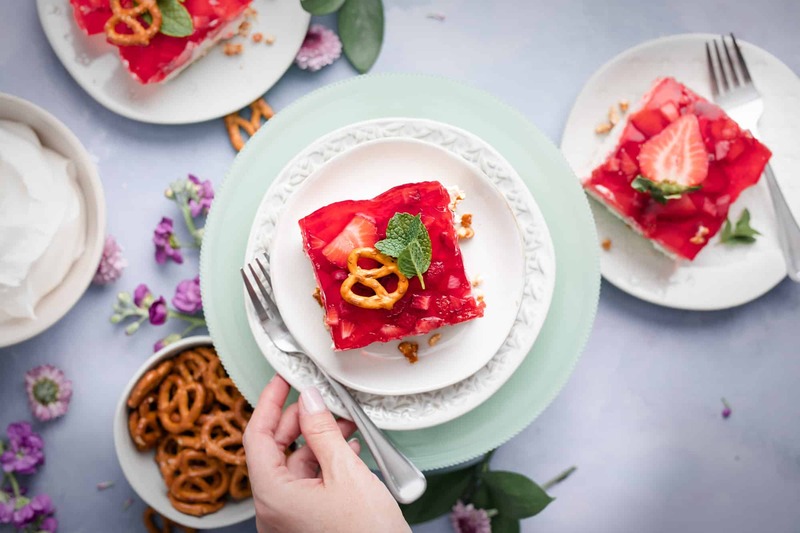 If you refrigerate it between prepping it and broiling it, you’ll want to keep it in the oven a few minutes longer just because it will be cooking after being cold instead of coming straight out of the Instant Pot. Hope you have a wonderful time on Saturday! Any chance I could use whole milk instead of heavy cream? Don’t keep heavy cream on hand. Yep! Milk works. Cream makes it a bit richer, but milk still will make the sauce. Could I use chicken broth for this? I was very unsure of the one minute pressure cooker time, but it works! Also, I used a mandoline to slice the potatoes, so i had very thin even slices, which worked perfectly. I added chopped ham to the cheese mixture and was thrilled with the results. Thank you! The flavor was absolutely wonderful. I used three different cheeses: the main cheese was 2 year old cheddar, Gruyer, and a little Monterey Jack. However, I found the sauce much too runny. I suspect that there was too much liquid left over after cooking the potatoes. I think I followed all of the instructions to the letter. Can you provide a measure for how much liquid to use? How many minutes on the saute setting and should it be on the seal function all the time? Used red potatoes (left some skin) and added several slices of onion. Used chicken stock and added a Tbl of butter to the cheese sauce. Was out of thyme so added a sprinkle of Italian seasoning. Came out very good, but the potatoes were on the verge of being a tad mushy – important to do the quick pressure release as soon as the 1 minute is up. 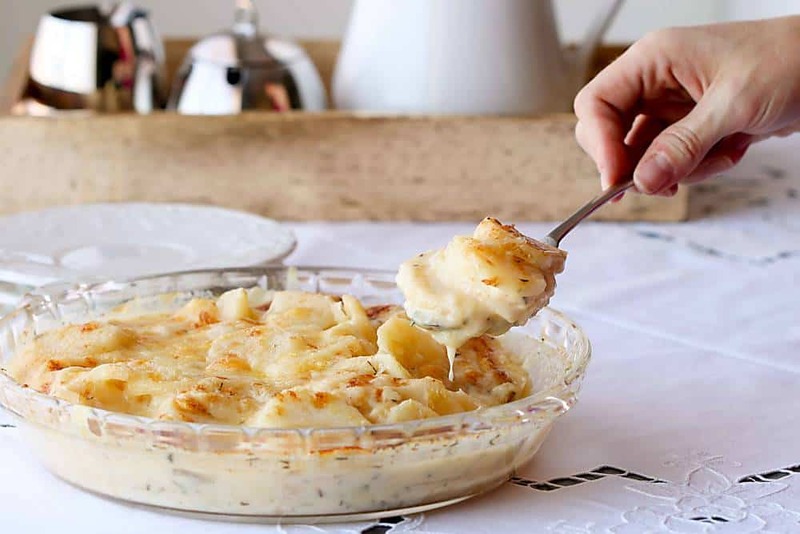 Bottom line – a quick and delicious way to enjoy scalloped potatoes. Made this today. It was fabulous! Will be a family favorite! Out of the refrigerator for 1hour and add cheese on top and broil??? Overnight in frig doesn’t change the flavor?? Hi Nancy, that’s exactly right! And no, the flavor should stay the same. Hope you enjoy! This will be the first try at using the Instant Pot. Can’t wait ? wish me luck ? I haven’t tried this recipe yet, so I didn’t rate it. However, it looks delicious and I’m going to be trying it in the next few days. My wife used to make scalloped potatoes in the oven and add thinly sliced onion. The onion cooked in the oven. She passed away recently, so I’m doing my own cooking. I recently bought the 8 quart instant pot to make cooking for myself easier. Should I put the onions in with the potatoes in the instant pot or cook them separately and add before broiling? I don’t like the second scenario because it makes the recipe more involved. Please let me know what you think. Love your videos and enjoy your banter. Those that don’t like it should go elsewhere. There are many cooking videos on the web. I saw it done both ways in the comments. Both said it turned out great. Is it possible to replace the heavy cream with a lactose-free milk? Would you reduce the amount at all? Thank you! They ate ALL of my cheddar cheese. Grrr. Seriously didn’t realize it until Easter when everything is closed. Had mozzarella. Hmmmm. Made what I am calling Italian scalloped potatoes. Instead of the thyme I used Oregano and basil. And my mozzarella… Turned out delicious. ? Made this as the side to prime rib for Easter and it was fantastic!! Super easy and fast! This will be my go to from now on! Can’t wait to try this recipe! I was planning on doubling the recipe but I have an 8 quart Instant Pot. Does this change any of the timing or the settings? Also, have you weighed the potatoes when you have made it? Would doubling mean 4 pounds of potatoes? Thanks so much! Hi! timing and settings will be all the same for 8 quart. And yep, 4lbs would be doubled. Cheers! Au gratin means “with cheese.” Scallopped potatoes do NOT have cheese, but au gratin potatoes do. So these are NOT scallopped potatoes, they are au gratin potatoes. Hello. Would I be able to use chicken broth as I don’t have vegetable broth?? Yep! That would work great, too! I had a lot of liquid left after cooking for 1 minute in the IP. I would gather I had pretty much 3/4 cup or more left and I measured both the water and weighed the potatoes. I’m gathering I should have removed most of the water as my sauce isn’t thickening at all (but tastes great!). When I make for Thanksgiving this weekend, how much water should I leave in there? 3 Tbs? Oh wow! Yeah, I would drain off a bit just so you get a thicker sauce. 1/4 cup left in the pot as most would be my suggestion, though I usually only have a few tablespoons that remain. I don’t know how any liquid can be lost during cooking. If you put 1 cup of stock into the pot you should end up with at least that much after releasing the pressure. I halved the recipe in my Instant pot mini to get just enough for two servings. I certainly had to remove 3/4 of the liquid and also added some corn starch to aid thickening. Prior to cooking the potatoes, I sauteed 1/2 cup of white onion. One minute on pressure cook after adding the potatoes to the onion cooked the potatoes to perfection. The resulting meal was too salty for my taste so next time I will add no salt (there is plenty in the cheese) and allow each person to add salt to their own taste. Now I must search through your other recipes for more delights. Sure thing! Will work great, too. Hi Jan! I’m so sorry this didn’t work for you. I’m wondering if there was a malfunction with your Instant Pot. I usually don’t use the steamer basket and just put the potatoes straight in, but either way, 6 minutes is a long time and if the pot’s working properly, whether in the basket or in the bottomo of the pot, would turn the potatoes to mush. Did the pot fully seal and build pressure? Was there pressure released when you flipped the pressure valve after the beep went off? Hi there Joanie. I just got my Instant Pot and this was the first thing I made in it. I have been making homemade scalloped potatoes with diced ham from a recipe my best friend gave me for years. And so I used your recipe to make them in the Instant Pot but I added some diced onions, ham and Garli Garni (all purpose seasoning). And they were amazing! They were totally different than the homemade scalloped potatoes that I usually make but they were so delicious. Everyone in my family raved about them. And the potatoes were cooked so perfectly…. My mother isn’t a fan of “ham and scallops” but even loved these ones. Thanks so much for sharing these! This is going to be on rotation at my house from now on. By the way, I didn’t even read the directions on how to use my Instant Pot and I was able to follow your directions so easily. I just wanted to comment on how easily and thoroughly your directions were. I gotta say, I never comment on these pages, but I had to break my silence for this recipe. This was a spectacular winner!!! This will be in my IP repertoire for years to come. Well done!!! And thanks!! Doubled the recipe but kept the cooking times the same. Excellent recipe! Using that cheese made it so flavourful and I didn’t miss the onions at all! Great recipe. Worked great for Christmas dinner. Doubling it is easy. Thanks! I made this for Christmas dinner it was excellent!!! Thank you! Made a few modifications. Sautéed 1/2 cup finely chopped onions in a tablespoon of butter in the instant pot first, then continued as per the recipe. Very tasty! I will definitely make these again! I admit I was skeptical about one minute….but it worked!! Delicious!! Used non dairy milk instead of the broth. Can I 1/2 the recipe and still use the same setting? It’s just two of us. Yep, the cook times should be the same. I’ve never tried halving it before, but it should work the same. Cheers! I am constitutionally incapable of following a recipe to the letter, so I added bacon and ham. And baked it at 450 degrees in my largest inch cast iron pan. Yummers! By the way, I used 5 pounds of potatoes and the potatoes stuck to the bottom of the pot, but they still were perfectly cooked or almost perfectly cooked. I cut them in my cuisinart instead of by hand, so they were thinner. Next time, I am going to use 3 cups of liquid with the potatoes instead of 2. I also sautéed my bacon and onions in my cast iron and then added ham and the potatoes to it. It really did come out good. Oooh, bacon and onions! NIIICEEEEE!!! I want to try making these tonight. Does it has to be sharp white cheddar as all I have right now is the normal cheddar ( block of orange) .. would that be fine to use ? Yep, regular cheddar works too! Wonderful recipe – the precise timing for cooking potatoes and how thick the slices need to be are a godsend. Made last night and DH who doesn’t tend to like potato gratin ate 3.5 portions and complained that he ate too much was testament to yum. I made a few mods because we don’t eat too much cheese in our household. DH is sensitive to dairy and is also Celiac. I used 1/2 of specified amount, and substitued some kind of Farmer’s Market raw milk cheese and added 1-2 tsps of cornstarch mixed with 1/4 cup of water to the Instapot ‘drippings’ before , cooking then adding the cheese and whisking to smoothness. I also mashed a fresh garlic clove in. Excellent! I made the recipe as written, but with chicken broth (Better Than Boullion) instead of vegetable broth. I used German yellow potatoes, and they held their shape nicely. This is now my go-to recipe for scalloped potatoes. They look delish and no doubt they are! 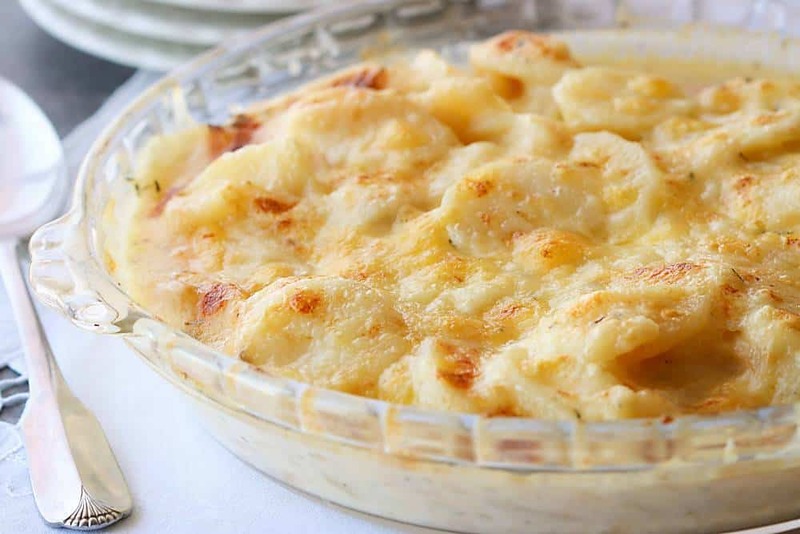 !….but scalloped potatoes do not have cheese in them. Shouldn’t you be calling them Augratin Potatoes? I have a regular pressure cooker, not an insta pot. How long should I cook the potatoes? Will yellow potatoes work ok? I have only ever made this recipe with russet potatoes, but I have heard from others that waxy varieties like red and yellow potatoes work fine, too.